The control arm of your vehicle is an integral part of your Mercedes Benz Suspension system, as it controls the car over bumps and holes or in case of quick stops. Your suspension works by controlling the vertical movement of your vehicle and it keeps your tires in contact with the road which is essential for a better and safer ride. 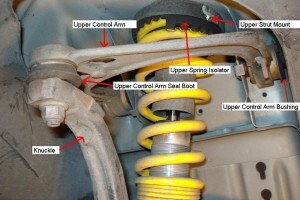 However, the suspension could not operate without the help of your Mercedes Benz control arm. 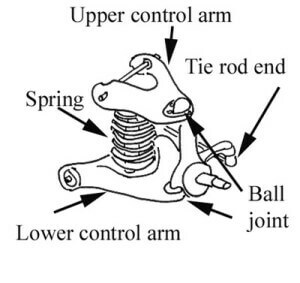 As you can see from the diagram, The Mercedes Benz control arm is like a metal bar that has a pivot at both ends and what is called rubber bushings at the other. The Mercedes Benz control arm allows your tires to move up and down freely, which provides for a smooth and safe ride with the least amount of friction as possible. The upper and lower control arms of your Mercedes Benz is one of the most essential components of your suspension system. It truly helps in the proper handling of your vehicle. Some Mercedes Benz vehicles have up to 4 control arms on each corner of the vehicle for as smooth of a ride as possible. These control arms and the bushings need to be properly maintained otherwise you will have a very uncomfortable driving experience especially over rough terrain. Also if you leave them to wear down too much you will run the risk of damaging the whole suspension system and the quality of your Mercedes Benz. If you notice and wear on your control arm it is better if you replace it immediately to prevent any major damage to your whole suspension system due to your wearing control arm. The Mercedes Benz suspension system is very fragile that’s why it needs essential care and maintenance in order to perform efficiently. Remember, as soon as you suspect the suspension is experiencing wear and tear please bring your Mercedes Benz to German Car Depot for a full inspection or to replace your control arm and bushings.